HandKrafted by Stephanie: Taylored Expressions January Blast from the Past Blog Hop!! Taylored Expressions January Blast from the Past Blog Hop!! Edit 2 (I promise this is the last one! ): I realized that my tag fell off the 2nd time I photographed the layout - final photo uploaded. Edit: Uploaded a new photo of my scrapbook page since I realized that I cropped the photo of Sabrina to 72 dpi instead of 300 dpi. I printed a new photo, swapped it out and took a new photo of my page. Hello! 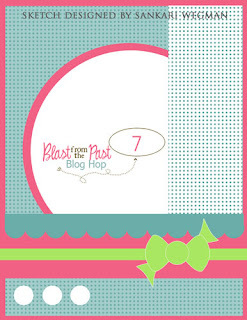 I'm excited to be participating in the first Taylored Expressions Blast from the Past Blog Hop of 2011! Each month, Taylor invites her customers to participate in this fun hop and feature Taylored Expressions Stamps! The theme for our January hop is LOVE. If you happened here by chance, please check the full list of participants at the bottom of this post! I used Love is Everywhere for my card (above) today. I embossed the sweet little house with some sparkly Jeweled Gold embossing powder. I also stamped the heart kite (and popped an additional heart over it for some dimension). The sentiment is stamped on a tag and is from the same set as the fun images. Most of my supplies are from the Valentine Project Kit (cardstock, patterned paper, ribbon and brads!). Note: While I was linking up this set, I noticed that Taylor is having a Valentine's sale and this set is 20% off through January 23! I also made a 6" x 6" scrapbook page of my DD, Sabrina. Again, most of my supplies are from the Valentine Project Kit and the sentiment, "Bursting with Love" is from Love Everywhere. Accessories: Standard Circle Nestabilities SM and LG, Tags Five Shapeabilities (Spellbinders), Lace Heart border punch (Martha Stewart), Love is in the Air embossing folder collection (Provo Craft), Jeweled Gold embossing powder (Stampendous), Divine Twine, Button, Valentine Project Kit (Taylored Expressions), Foam tape, Thread, Sewing machine. Accessories: Standard Circle and Big Scalloped Circle Nestabilities LG, Tags Five Shapeabilities (Spellbinders), Divine Twine, Rose (Prima), Valentine Project Kit (Taylored Expressions), Doily, Thread, Sewing machine. This is gorgeous, Stephanie! I love the vintage look you achieved with the Valentine Project Pantry. And that glittery gold house is amazing! I love the gold house--just awesome, what a great card! And your daughter Sabrina is beautiful! Great job. Love the colors you chose and the ribbon treatment. I love the heat and dry embossing on this - all the textures on your card are fabulous. Awesome how you turned the sketch into a Scrapbook page - Loving that! Both your cards are adorable...the little sparkly house is sooo cute and what a gorgeous picture of your DD!!! Wowwie Stephanie these are both beautiful!! The gold house is stunning. But my favorite is your adorable daughter. What a fantastic idea for a card. I know it melted my heart! Great card and scrapbook page! 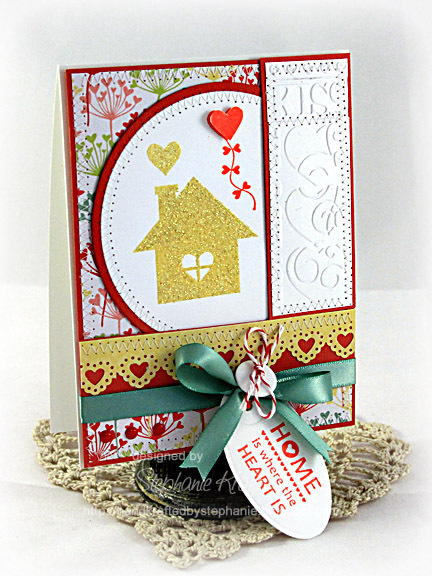 I really like the glittery house and embossed panel on your card and the colors and papers on your SB page! Both your card and your page are so pretty! I espeically love the glittered house! You rocked the sketch! I love your card and the page with your beautiful DD is lovely!! What a fabulous card and scrapbook LO!!! I have to ask, how do you get the stitching so perfect!?!? A-MAZING!!! What a beautiful daughter you have Stephanie!! Gorgeous layout and love your delightful card! Your projects are so sweet! I love the gold house, and that cute page of your daughter is fabulous. Such sweet and darling projects! I love that glittery little house! Stephanie - I really like the card you made - the deeply embossed side panel is beautiful! And the backing papers are great. I love the 6x6 LO of your daughter. She's just beautiful. The colours are soft and femine, and I like the doily frame around the picture. Wonderful! This is a fabulous card Stephanie! I love everything about it. I love both of these projects Stephanie! The heart balloon is the cutest thing ever and the scrapped LO featuring Sabrina is precious! Such a cute Valentine, Steph -- love that embossing folder! And the scrap page of your daughter is so sweet! Great use of the sketch on both of these projects! The scrapbook page is wonderful and I love that sweet card!! Delightful card Stephanie! And the scrapbook page is sooo cute! LOve the design on your house card and the scrapbook page is wonderful. Beautiful card!! So many neat elements to it. Your scrap page is cute too!